Increases accuracy by providing a lighter-feeling, smoother-operating trigger with no take-up or overtravel. Lets you concentrate on making your shot and not overcoming a long, heavy trigger pull. Adjustable for weight of pull from 1½ to 4 lbs. Changes in letoff are conveniently adjustable from outside the stock with the turn of a set screw. Models for Ruger M77® Mark II™, M77® Hawkeye®, and 77/22®. SPECS: 17-4 stainless steel, dark grey. .250" (6.3mm) wide shoe. Includes Allen wrench, spring seat and instructions. Mark II™ - Fits Ruger® M77® Mark II™ centerfire rifles except VT varmint models with 2-stage trigger. Hawkeye® - Fits all M77® Hawkeye® centerfire rifles. 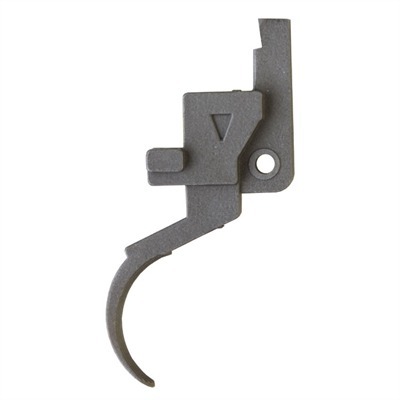 77/22 - Fits 77/22® in .22 LR, .22 magnum, .22 Hornet, 77/44® and 77/50™. Gunsmith fitting required.